Create your own fruit trees through our grafting workshops, videos, and more. Grow fruit that has been lost in modern day supermarkets. Information & Events for Members of MidFEx. Learn the secrets of growing apple trees in limitied space. A how-to guide and virtual tour. Descriptive and detailed links for backyard fruit growers and Chicagoland gardeners. Tool used to track member fruit list and to aid in IPM. Take a look at our Pawpaw page. This unique fruit is easy to grow, tastes great, and is good for your health. Click here to see what MidFEx members are growing. We put on a terrific show. Highlights included having nearly 100 different apple varieties on display and for tasting! The public seemed to particularly welcome our cider press, which generated a continuous crowd waiting to sample the free cider. We served over 3,000 samples! Like last year, we had some pawpaws which we cut up. This gave many who visited us the opportunity to taste this unusual and easily gown fruit. There was a lot to see. We had a demonstration of apple dehydrating, and samples were given out. American persimmons and Asian pears were on display and also available for tasting, as were black walnuts and wild hazelnuts. 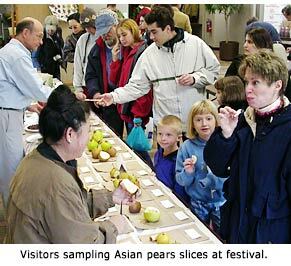 Other displays included many different European and Asian pear varieties. Visitors could taste a slice of an heirloom apple. MidFEx volunteers were always on hand and answered many gardening-related questions. We had 13 unusual and tasty apple varieties for sale including some classics like Ashmeads Kernel, Ross Nonpareil, and Northern Spy as well as some great newer varieties like Rubinette, Stellar, and Razor Russet. Labeling apples for festival Apple cider, apple butter, and peach butter were (as usual) brisk sellers. This year we expanded the number of non-edible fruit related items including some very informative books on fruit growing as well as hand-cranked apple peeler/corer/slicer machines. We again enjoyed being at the Chicago Botanic Garden. The set up in the Regenstein Center worked out well. The Chicago Botanic Garden staff during the show were very helpful and supportive. several years ago as a result of discussion at a MidFEx picnic to give us a start, and so other growers in the area could add information from their experiences. 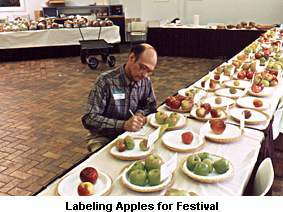 Bob Kurle was one of the top fruit and nut enthusiasts in the U.S. He corresponded with fruit and nut growers all over the world. In the 1970s he produced displays at the Chicago Flower and Garden Show in McCormick Place that stimulated many ordinary gardeners to become interested in dwarf and dwarfed fruit, hybrid nuts, and growing the best varieties suited to the Chicagoland area. He has appeared in Organic Gardening and the Chicago Tribune. As an officer, director, and hardworking member of NAFEX (North American Fruit Explorers) Bob was responsible for organizing the Chicago Chapter of NAFEX which later became MidFEx (Midwest Fruit Explorers), a separate not-for-profit organization. Bob was dedicated to gathering, testing, and sharing information about fruit and nuts that will do well in our area. Bob was always generous in sharing his encyclopedic knowledge, his growing techniques and his seeds and scion wood. We all owe Bob a big vote of thanks and the best way we can thank him is by adding information to this list of fruits and nuts for the Chicagoland area. - Enter the username or email address you used to sign up and click ‘Enter’. You will receive a new password via email. This email message will address your name with a temporary password. Note that the email will not reference this site. You should change this password as soon as you come back to sign in (email is not encrypted).